Welcome to this month's Taste Creations Linkup where we will be sharing recipes using Leeks! 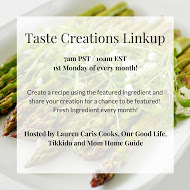 The Taste Creations Linkup happens on the 1st Monday of Every Month at 7am PST / 10am EST. You can participate by submitting your recipes below any time until the 8th February at 7am PST / 10am EST. Next month we'll feature our favourite and most creative recipes from this month, so make sure you submit your post below! 2) Please follow your Hosts on social media! 3) Have a Visible Link Back to *Our Good Life* on your blog and in your recipe submission post. You can grab the Taste Creations button below to do this! 4) Please do not link up any round up posts. We ask that all images be original by you. 5) Visit at least 3 other posts and don’t forget to comment! We will try our best to visit as many linkers as possible. 6) By linking to this party you are giving Lauren Caris Cooks, Our Good Life, Tikkido and Mom Home Guide permission to feature one picture on our websites, social media, and blogs. Proper credit will always be given to you. Neither Lauren Caris Cooks, Our Good Life, Tikkido or Mom Home Guide is responsible for stolen and/or misused images, misused projects and ideas. This month we are featuring the lovely LEEK. Leeks belong to the onion family and differ in that the leek forms a loose set of leaves around a stalk, instead of packing tightly together like onion. Therefore it is easy for dirt and sand to get trapped in the leaves. Soaking leeks helps remove the trapped dirt and sand. Leeks are one of the national emblems of Wales and is used extensively in that country's cooking. 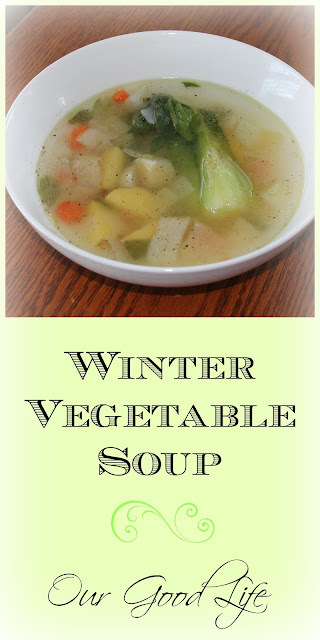 Today I made for you a soup with frozen leeks. I love having a bag of leeks in my freezer ready to go. Leeks are easily grown, so to freeze the excess means you can have your own leeks ready for you at a moments notice. It does not take long for leeks to thaw. In a large heavy saucepan, bring the water, 2 tablespoons of the olive oil, and salt to a boil. Add the vegetables and garlic and simmer, half covered, until the vegetables are very tender, about 30 to 35 minutes. Pepper liberally. Date live: Monday 7th March 7am PST / 10am EST Join Us!